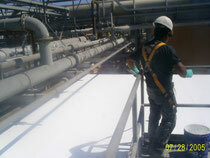 Roof Coatings - Premier Corrosion Protection Services, Inc. Roof Over Existing Tar & Gravel Roof - Installed rigid insulation over old tar and gravel roof with multiple leaks. Completed the repair with a fully adhered coating system with a 15 year manufacturers "leak free" warranty. 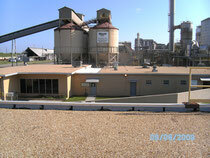 Fly Ash Building - Severely corroded standing seam metal roof and ducts coated with 2 coats of anti rust primer and two high reflective finish coats. 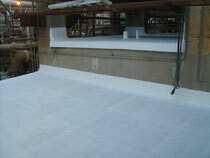 MCC Room Roof - Removed non-adhered HDPE membrane that had leaked and replaced with a fully adhered rigid insulation, two foundation coats with and FRP scrim sheet and completed with two reflective white finish coats. 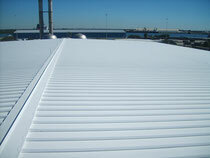 This roof has a 15 year manufacturere leak free warranty. 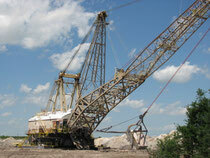 Draglines - Large cranes used for the minimg of phosphate required a flexible waterproof roof capable of withstanding severe heat as well as movement. Holes and roof penetrations were sealed with a flexible scrim sheet embeded beween two coats of foundation coat and completed with two coats of reflective white finish coats. Office Building Roof - Installed rigid insulation boards over the failed tar and gravel roof. 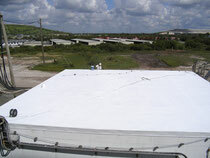 Installed a fully adhered roofing system with a 15 year leak free manufacturers warranty. Electrical Building Roof - Installed rigid insulation boards over the failed tar and gravel roof. 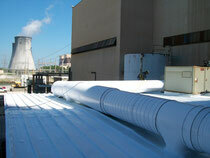 Installed a fully adhered roofing system with a 15 year manufacturers leak free warranty. 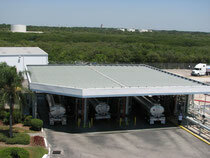 Fuel Loading Area Roof - Rusted standing seam metal roof over a fuel loading facility. Two caots of anti rust primer with two reflective white finish coats. 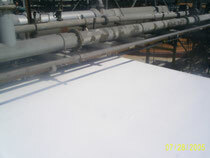 Office Building Roof - This roof required that we build a roof over the existing roof in order to obtain positive drainage. Motor Control Center Roof - Installed rigid insulation boards over the failed tar and gravel roof. 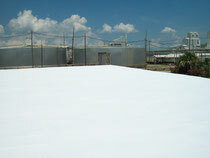 Installed a fully adhered roofing system with a 15 year manufacturers leak free warranty.